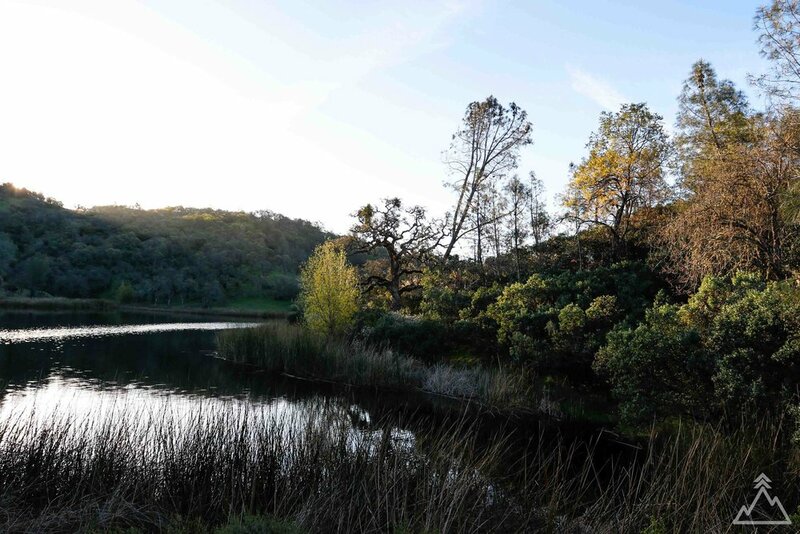 Henry W. Coe State Park is one of the few parks in the San Francisco Bay Area not completely overrun by visitors on the weekends. 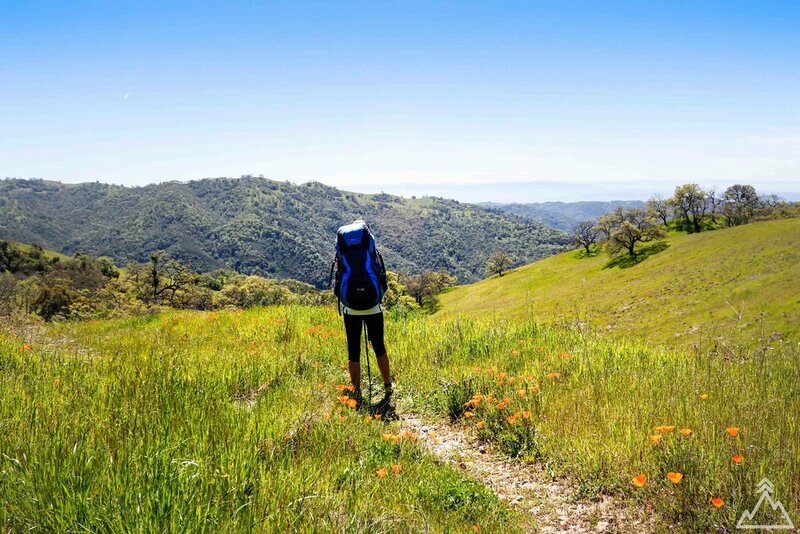 It is also one of the few parks where you can backpack and wilderness camp without needing advanced permits, which means it is also one of the most accessible parks for backpackers. Coit Lake is a favorite location especially if you are interested in fishing, we have had good luck catching fish, such as bass, each time we have been to this lake. You can also take a dip in the lake, which tends to warm up enough to be enjoyable in the summer. 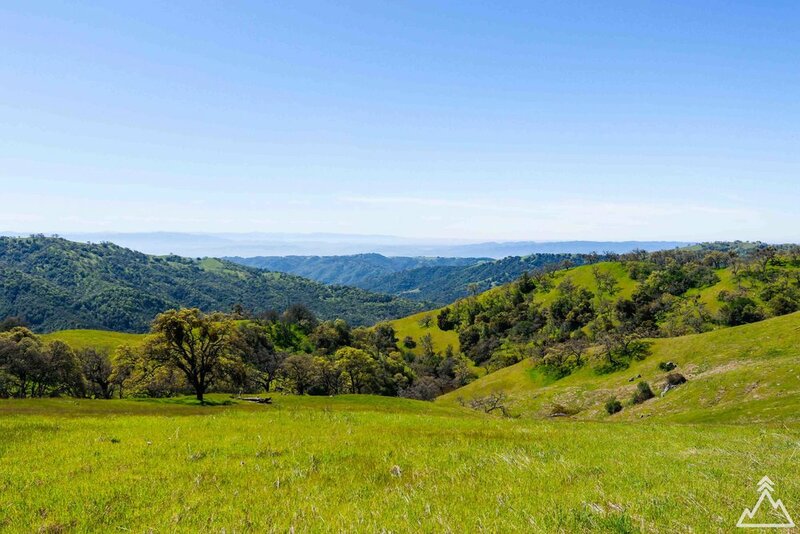 In the spring, enjoy the rolling green hills and abundant wildflowers. 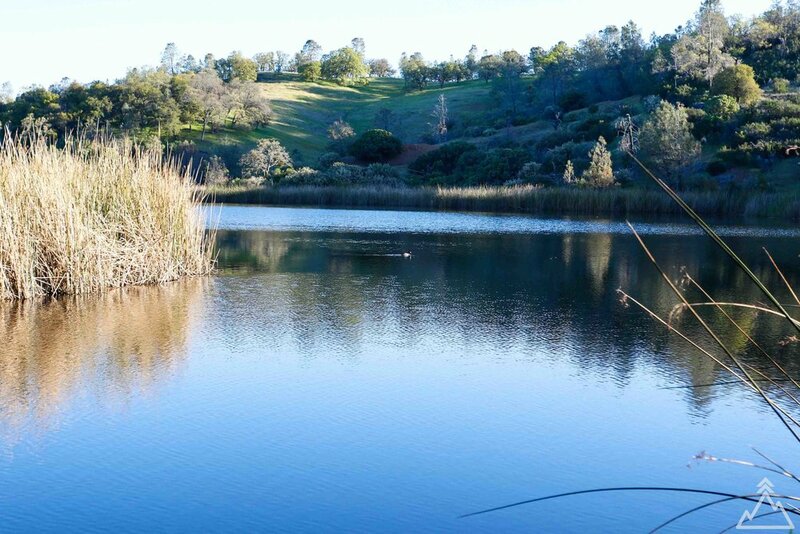 Henry W. Coe State Park is the largest state park in Northern California, spanning 87,000 acres. This park includes a large portion of the Diablo Mountain Range and encompasses a large number of lakes, rivers, valley and mountains. You can read all about the park here. We have fond memories of the park as it was our first backpacking trip. This park has the huge advantage of being much less crowded than the majority of San Francisco Bay Area parks, affording a much more personal wilderness experience. The ability to camp where you'd like in the park (instead of being limited to an established campground) is an additional plus. If you're looking for a different backpacking experience without having to reserve a campsite 6-12 months in advance, this park is for you. The first ~6 miles of this hike are identical to our earlier Kelly Lake Loop post. This hike to Coit Lake begins at the park back entrance at Hunting Hollow. This entrance is about 50 miles south of San Jose in Gilroy. You can get directions in the Directions section below. The Hunting Hollow park entrance is unmanned. Once you park your car in the parking lot, you will want to fill out your permit form and pay your per-person backpacking fee and car fee at the permit station. After this, begin the hike by continuing to head up Coyote Creek Road. After about 2.0 miles, take Cork Road to Grizzly Gulch Trail to the right. You will remain on Grizzly Gulch Trail for about 2.5 miles, climbing 1,100 ft.
Once you hit the Dexter Trail split, take Dexter Trail to the left for another 0.6 miles, and then a left on Wasino Road, continuing for 0.2 miles. At this point you will hit the Kelly Lake Trail junction to the right, which will take you down to Kelly Lake. Coit Lake is another relatively easy 1.5 miles past Kelly Lake on Coit Road (trail splits to the left after you reach Kelly Lake). You can descend on Coit Lake either from the southern point (Coit Road) or northern point (Coit Dam Road). Our favorite campsites are on the west side of the lake, where they are more secluded and offer easy access into the lake. Being near the lake is extremely convenient because you can easily filter water for your cooking and drinking needs. You can also take a dip in the lake or fish in the lake if you have your required fishing permit. If swimming, note that the water is relatively cold in the spring/fall, and only truly warms up in the summer. Wake up early and take a stroll along the lake to enjoy watching the wildlife wake up. We've seen deer drinking from the lake in the morning, and there is an abundance of ducks and birds as well. Once you're ready to head back, you take Coit Road back down to Kelly Lake. At Kelly Lake, you have two options: you can head back the same way you arrived, climbing out using the steep Kelly Lake Trail, or you can take the more gradual grade route out using Coit Road. If you want to mix it up, we recommend the latter. You'll get some good views of Kelly Lake during the ascent as well. Once you have climbed Coit Road for 1.8 miles, take the Wasino Road junction to the left. Continue on Wasino Road for 0.6 miles until you hit the Jackson Road to the right. Jackson Road will take you along the ridge for about a mile with some amazing views of the faraway hills, a huge number of wildflowers (if you come in the spring), and reed-lined ponds. Once you hit Rock Tower Trail take it to the left and head down the valley until you connect back with Grizzly Gulch Trail. From here, it is a rapid descent back down to Gilroy Hot Springs Road and back to your car (and In-N-Out on the way home!). Happy Hiking! With the GPX route downloaded on your phone, you can follow your location against the trail, even in airplane mode or when you have no service. To learn more about GPX files and how to use them, see the GPX 101 page. Fishing permit - Coe Park has great fishing for largemouth bass, green sunfish, crappie, and bluegill in its lakes and ponds. You can read more about fishing at Henry Coe here. You can get your fishing permit here. Water filter - Make sure to bring a water filter on this trek. You will be taking water out of the streams and lakes to drink and need a water filter to make sure it is clean. For our water filter recommendations, see the Gear Checklist. Car camping - If you don't want to backpack, you can also car camp in Henry Coe. To make car camping reservations, see the reservation website here. 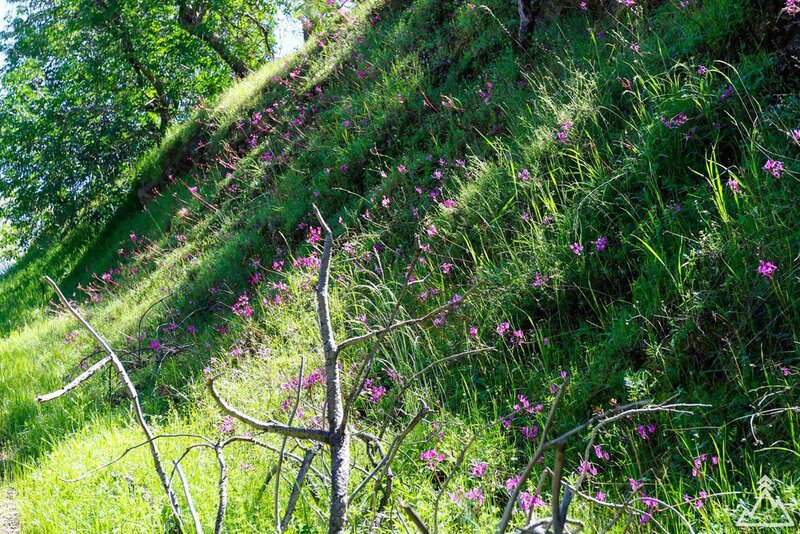 Wildflowers - Visit Henry Coe in the spring to see hills full of gorgeous wildflowers! 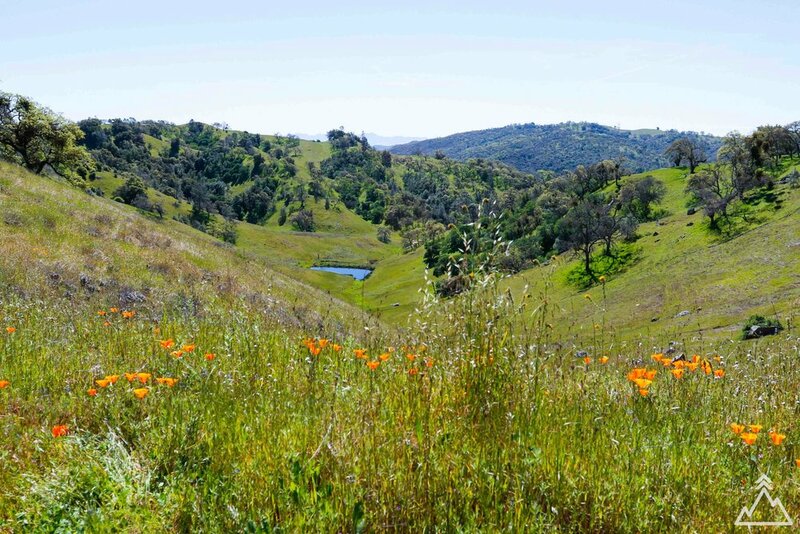 You can see what's blooming now at Henry Coe here. Plan and pack your gear - See our Gear Checklist section for a comprehensive gear checklist and some tips and favorite items of ours. The trailhead begins at the Hunting Hollow Park Entrance. Click on the directions icon to pull up custom directions in Google Maps.